Sun Barrier Products, Inc. is proud to offer ProVia Door Products. ProVia Door is committed to making doors the professional way, individually customized for durability, security, and energy efficiency in the residential market. Durability: Top quality construction with the finest materials and backed by the ProVia Lifetime Limited Transferable Warranty. SIGNET FIBERGLASS: realistic woodgrain in 5 grain options; Cherry, Mahogany, Oak, Knotty and Fir. HERITAGE™ FIBERGLASS: smooth woodgrain in Oak or Hemlock and Smooth finish painted surface. LEGACY™ STEEL: woodgrain textured or smooth. Add Decorative Glass, Privacy Glass, or INSPRATIONS ART GLASS. All ProVia Doors come with professional grade hardware from Schlage , Trilennium or Emtek in a variety of finishes and styles. 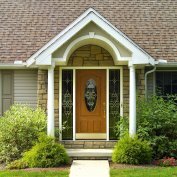 All door styles are available as a single door or French (double) door, inswing or outswing, and you may also add sidelights and a transom. Choose from the Spectrum door with Invent Retractable Screens, Decorator, Deluxe, Duragard or Superview Storm Doors. Come visit our showroom and manufacturing plant!